Environmental Friendly Next-Generation Batteries,Can Be Recycled After End of Life. FHR-3RTU:AA Environmental Friendly Next-Generation Batteries,Can Be Recycled After End of Life. Great improvements have been made to the self-discharge property of rechargeable batteries with PROLIFE batteries, so they can be used immediately after purchase. You can use recharged PROLIFE batteries at any time you want, even one year after purchase.You can recharge them approximately 1,000 times. 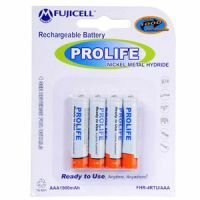 In addition, end-of-life PROLIFE batteries can be recycled and they are thus really environmentally friendly next-generation batteries. To Recieve updates and possible rewards for Fujicell AA 2200 mAh Prolife please sign in. To Recieve updates and possible rewards for Rechargeable Battery please sign in.